Kaloam Unsterilised 25kg For Cricket Pitches. 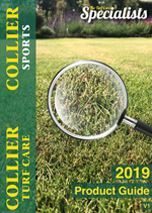 Available at Collier Turf Care. Test, County and Club wicket quality Clay 31%, Silt 38%, Sand 31%, Motty strength 88 kg (A heavy clay loam screened to 4 mm which rolled under the correct soil moisture conditions gives hard wickets of consistent pace and bounce. Adequately supplied with available nutrients for healthy grass growth. pH 7.9).